On January 7, 1827, Canadian surveyor, engineer, and inventor Sir Sandford Fleming was born in Scotland. He served as the chief engineer of both the Intercolonial (Maritimes-Quebec) and Canadian Pacific Railways. In what can only be imagined as a stunning eye opener, Fleming saw first hand what a size Canada was – 38 times the entire United Kingdom. Following his vision of linking a country coast to coast, he surveyed the breadth of Canada for a national railway on foot, horseback, and in canoe. He worked with teams he organized to note everything they saw along their way, from plants and topography to settlement and agricultural potential. Through fire, ice, heat, insects, and hazards by the score, he calculated the number of curves and the angles of slopes the railroad would cover. He wrote up handbooks, reference guides, designed tools, spoke to committees and government officials… whatever it took to realize his vision. However, as railroads brought people together, every town still had its own system of time. Travelling by train from one end of the line to the other meant over a hundred different possible pocket watch adjustments by travellers! If you didn’t have a pocket watch and wanted to travel? Fuggedaboutit! Days were divided into two sets of 12-hours before, then after, the local solar noon hour. An almost non-stop traveller, Fleming battled to corral world decision makers to standardize the time of day. He spoke at public meetings, government meetings, commerce conferences, and wrote articles and letters to his international peers. In 1884, the International Meridian Conference dealt with issues that gave our present day sense of time and location. In that year, 11 national time meridians existed. Many arrived at the conference to pursue political goals. Sir Sanford Fleming helped keep delegates’ eyes on clarity of vision and purpose. It was also a great strength, as he knew it would be, to have previously communicated and met with many of the delegates. The prime meridian of Greenwich was chosen for longitude. The universal day was decided to begin at midnight counting the hours from zero and up to 24. Vision might have been Fleming’s middle name. An able draftsman, he designed Canada’s first postage stamp, essentially over breakfast with the Postmaster General! He wanted the beaver featured rather than the reigning monarch, Victoria, and helped link this symbol of Canada’s first economy to its clever industriousness and on into public consciousness. 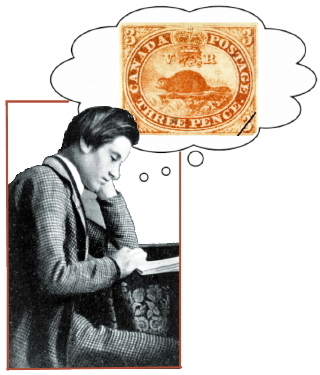 From a breakfast meeting, Sanford Fleming designs Canada’s first postage stamp. Along with others of great vision, Fleming led the founding of the Royal Canadian Institute and, three decades later, the Royal Society of Canada. He championed the laying of the telegraph cable from Vancouver Island to New Zealand and Australia. Fleming received a knighthood and many honours and awards. His name is memorialized in a town, schools, colleges, campuses, parks, plaques, portraits, statues, and the Sandford Fleming Foundation at the University of Waterloo. This entry was posted in On This Day and tagged January 7, On This Day, Sir Sandford Fleming, The Roberta Bondar Foundation. Bookmark the permalink.